isn't about changing what you do. It's about changing how you feel." 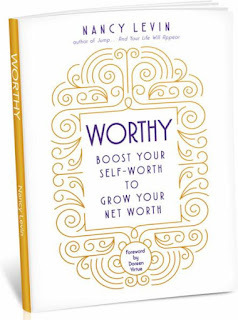 Nancy Levin, from her just released book, Worthy, continues: "In order to truly deal with our money issues, we need to go deep within and explore not just our feelings about money--but also our feelings about ourselves. That's because at heart, money issues are really issues of self-worth. In other words, our self-worth determines our net worth." She adds, "Until we truly feel worthy--deep inside--of the great life we desire, we won't feel worthy of money on the outside. When we don't feel worthy on the inside, we develop patterns that prevent us from having the money we want and need." She gives an example of someone desiring to and actually getting out of debt, and then not long later building debt all over again, like paying off the credit cards, then getting some more and doing it again. She asks, "why would anybody do that? Well, they wouldn't do it on purpose. But these kind of patterns are tenacious because they're created by unconscious feelings and negative beliefs that took hold in childhood." I became aware of Nancy Levin from an hour-long interview in March of this year. I had not read her first book, Jump . 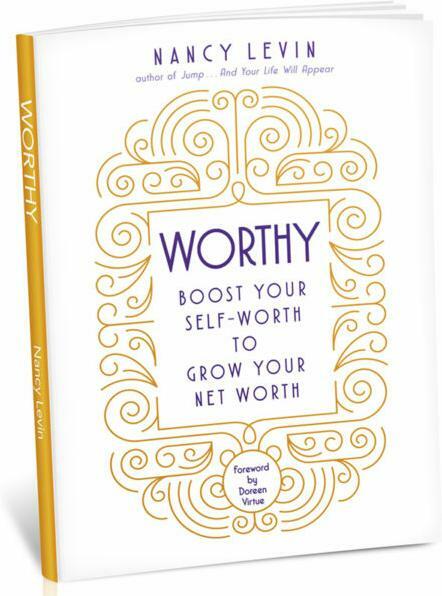 . . And Your Life Will Appear, and she mentioned in the interview that her second book, Worthy--Boost Your Self-Worth To Grow Your Net Worth, would be published in August. I was intrigued and pre-ordered a copy. It just arrived late last week, and I started reading on Sunday, and for me, this book is a very powerful tool for the wisdom and insight it contains, and more importantly, the exercises throughout the book to carefully expose those hidden patterns of behavior and where they began that still affect me so many years later. How many of my readers have heard such things as I did as a child, such as, "We can't afford that," of "Money doesn't grow on trees, you know," or "Save some for everybody else," or "You don't deserve that," or the classic, "There's only so much to go around?" This is the place where we learn precepts that will dictate many of our choices, attitudes, and feelings in our future lives. And, so often, we aren't even aware that they are there, or that they are in control in our later lives. We may wonder how it is that we keep making the same choices with the same kind of results whether it is getting things paid off and then charging again, or picking the same kind of partner who always seems to have the same kind of character that we thought we were avoiding, and so much more. It's not all about money, but, as I teach salespeople, "even though money is floating on the surface in virtually every selling situation, it isn't really there, it is far below the surface, because only 4% buy price, though 100% may speak of it." And so, though money is so prevalent in our lives virtually every single day, it is only a symptom of much deeper issues and patterns developed at a very young age. This book is extremely powerful as far as I'm concerned. And, though it is aimed at a female audience, I found it powerful for myself. I would highly and massively recommend it to any and every woman on the planet, and I also believe that men will gain multiple benefits from how many women are presented in the book to enlighten how they may unconsciously treat their spouses especially on the subject of money, and it will benefit them because they learned their driving patterns of thinking at a young age as well. The exercises help make all of that abundantly clear. Opening The Door To Positive Change Is As Easy As Opening A Book. Spread Some Joy Today--by feeling your self-worth. You are worthy of all the joy that is possible. There is more than enough to go around a thousand times.